listed companies with that of listed companies in foreign countries. ACARANUPONG, Kittima. 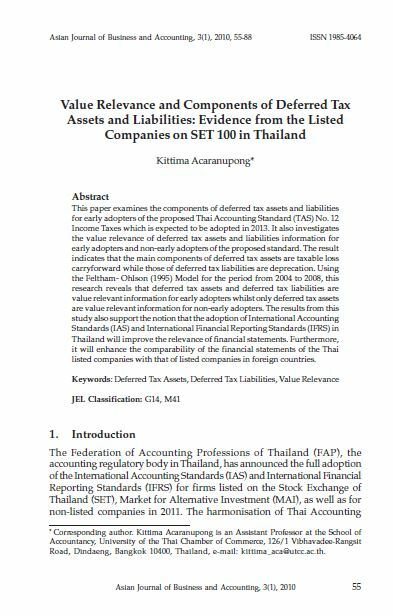 Value Relevance and Components of Deferred Tax Assets and Liabilities: Evidence from the Listed Companies on SET 100 in Thailand. AJBA, [S.l. ], v. 3, n. 1, p. 55-88, june 2010. ISSN 2180-3137. Available at: <https://ajba.um.edu.my/article/view/2222>. Date accessed: 25 apr. 2019.